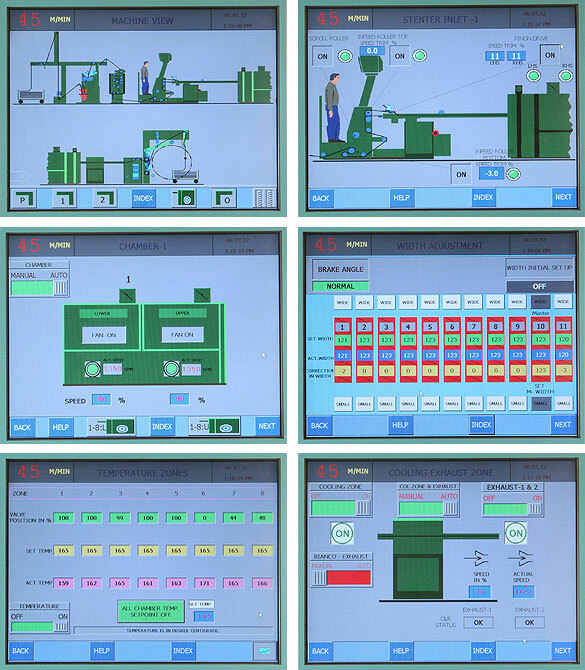 Programmable Logic Control (PLC) and process visualisation. All fabric transport drives with frequency controlled AC drives. Controlled declaration of speed to final standstill for normal shutdown and emergency stop. Control and Monitoring instruments in the inlet and outlet area. Switch cabinet wired ready for connection designed for ambient temperature of maximum 45°C and a relative air humidity of 90%. 12" touch screen at inlet, command input by touching the displayed range components. 6" touch screen at outlet. Machine can be operated from outlet touch screen also in case of emergency. Other accessories like Panel A.C., CCD camera with monitor, Microphone with speaker, field wiring cables, cable trays are available on request. Set up automation for the operating parameters- Production speed- Fabric feed device- Stretching device- Overfeed device. Selvedge tensioning at the inlet device- Fabric width adjustment- Treatment temperatures- Air circulation- Exhaust air suction. Display of previous and current alarm reports. "Process Control automation modules to achieve desired process conditions& ensure reproducibility & uniformity."